See the Castle, dating back to the Iron Age, home of several Monarchs and to the Scottish Crown Jewels & Stone of Destiny. Take a drive down the Royal Mile, experience ancient Edinburgh and the vibrant and bustling modern cosmopolitan city. At the bottom of The Royal Mile sits The Palace of Holyroodhouse, the official Scottish residence of the Monarch which was built in the 16th Century.Your tour will take you past the Scottish Parliament and round Arthur's Seat before heading out to visit Rosslyn Chapel. Built in the mid-15th Century it is one of Scotland's architectural masterpieces. 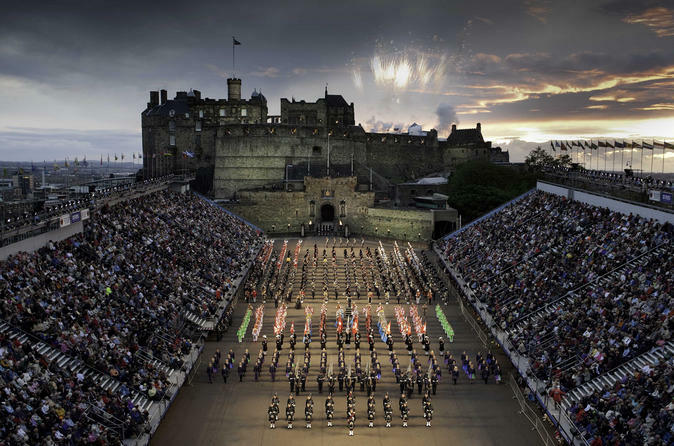 Later, we return to the City for your evening meal at a typically Scottish pub/restaurant before being driven up to Edinburgh Castle and your reserved seating for the evening performance of the world famous Edinburgh Royal Military Tattoo. After the performance you will be transferred by waiting vehicle, back to your hotel accommodation.